Today I have the pleasure of interviewing another friend of mine, Cédric Pla- I just love this guy! This great man is the founder and co-organiser of the Handpan World Music Festival, a handpan festival which is now in its fifth year. 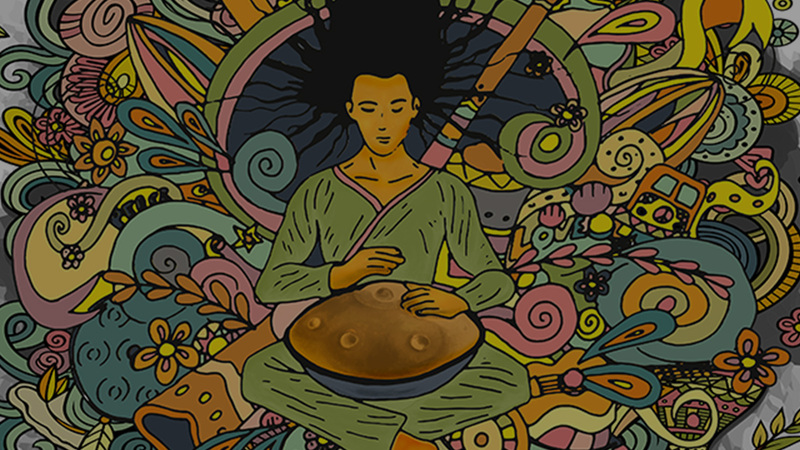 It is officially the biggest handpan festival in the world. This will be the fourth year I’ve played on stage and given handpan workshops there. From an artistic point of view I find this festival revitalising thanks to the great musicians I meet, and from a personal point of view I get to meet up with some dear friends there too. This festival makes me forget time; I am in my element, surrounded by people who love pans. Sorry, but I just can’t help myself from making a bad joke here, it really is Panradise! Ok, I’ll stop there and hand you over to Cédric. Hey, my friend, can you quickly introduce yourself? Hey, Dav! Hi to all the readers of the MasterTheHandpan blog. So, I’m Cédric and I’m 43. I’m married with two daughters and the four of us live in Sauvian in the south of France. I run my own business in the building trade, but above all else my passion is the handpan. So, what made you wake up one day and decide to start a handpan festival? When did the first festival take place? It was held on the 19th, 20th and 21st of September 2014. 800 people attended over 3 days. It was amazing, I don’t have the words to describe how I felt. I didn’t have a particular objective, I just wanted to do what I could, but I could sense a real desire for people to be present. In the end, 800 people came! I was over the moon! You made a really bad joke Dav, but, yes, I was in Panradise. The event was magical, I have never had so many kisses in one day! Many people felt the way I felt and asked me to put the festival on again the following year. Here we are now in our fifth year. It has really grown: last year over 7 500 people attended over 3 days. Are you looking forward to this year? What’s new? Any surprises? We have taken more of a professional stance with the handpan makers and international artists. There are more and more exhibitors and many choices of catering stands available. We have also adapted the site to make it more professional and improved the conditions for festival-goers. We have put a lot of work into the infrastructure this year. For the last 3 months I’ve been doing groundwork as though I was building a housing estate. It’s going to be wonderful. We really want to provide the best welcome we can. There’s drinking water and electricity on the whole site now. You just have to press the ‘On’ button and the site can come to life year-round. Everything we’ve put in place is staying. The landowner doesn’t use the site at any other time, which means that we’ll be able to organise other smaller handpan soirées and week-end gatherings at other times of the year, and maybe other projects too. Apart from that, there will be surprises but they will stay just that- surprises! All will be revealed in a few days! Who are the big name artists that the festival has had the honour of hosting? Seriously though, you are amongst those who have generously given their time and friendship. When I met you four years ago I was already a fan of your music, and to know that you were up for performing for free (even though I hate that) on our stage, just for the fun of sharing, really meant a lot to me. Thank you from the bottom of my heart! Cédric: There have also been some incredible players such as Kabeçao, David Kuckermann, Nadishana, Laurent Sureau, Jeremy Nattagh, Archer & Tripp, Mumi, Benny Bettane and many others. The group Balaphang also played and they really rocked! Actually, they’re coming back this year- not to be missed! I am friends with many of these people and I’ve seen the effort they’ve put into getting the handpan recognised out there. It’s just magical! David: So, what’s the line-up for this year? Cédric: There’s Alexandre Lora, Adrian Portia, Kabeçao, David Charrier, Laurent Sureau with Oloji, Alchimix, Balaphang. I’ll let you take a look at the website for the full line-up, but it promises to be something really special. This year, there’s a handpan family meet just before the festival opens, is that right? This year sees a springboard for young talent; What can you tell us about it? Ah, now this is great! We wanted to keep promoting fresh talent and to give them a chance to play on stage. We didn’t organise this part of the festival, the artists themselves did. There was an online application process from which people were selected to take part. Those selected will play on Wednesday and Thursday on the springboard stage in front of a panel of judges made up of Klaim, Kelu and David Charrier. They will choose the lucky winner, who then gets the opportunity to play on the main stage on Friday or Saturday night. You mentioned that there are more and more exhibitors and stands, or stalls? Yes, there will be 10 to 12 handpan makers! This makes us so proud. This festival has become a unique place in the world where people can talk to, try out and buy from so many different makers. It gives people the opportunity to buy a handpan at the festival. It’s crazy when you think back to how hard it was to get hold of a handpan just a few years ago! There will be around 60 exhibitors, so not only handpans but also instruments from around the world. There will be stalls selling handmade items, jewellery, and many other things besides. You can also discover The Universe of The Seven Chakras and its alternative therapy practitioners, including massage, yoga and much more. Will there be any handpan workshops? Thank you so much Cédric for all the weeks of working like mad that you and your team have put into this, to make us feel welcome and help us to experience some unforgettable moments. See you very soon, handpan family! What are your memories from the French Handpan Festival?